The first time I heard Porches was in July 2013. I was laying on a hallway floor inside a stranger’s house after a basement show, and someone had turned all the lights off and put the band’s record Slow Dance in the Cosmos on the speaker system. I realize that this sounds weird and irrelevant, but it was an ideal setting for my introduction to the music of Porches – dark, uncertain, a little lonely. Three years later, these same themes re-emerge in the band’s latest release, Pool, out now on Domino Records. 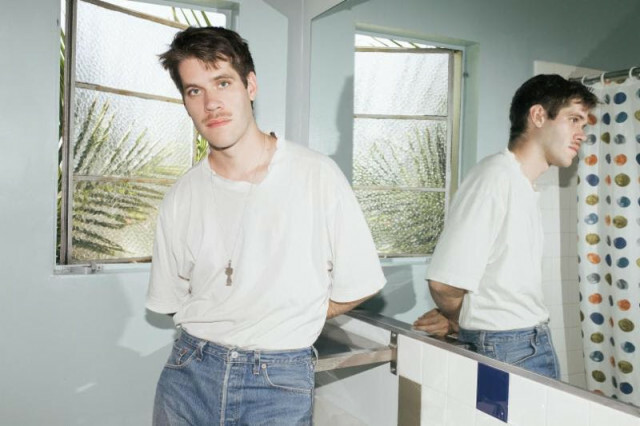 Pool is very polished and produced compared to Porches’ previous efforts, an especially impressive feat considering frontman Aaron Maine wrote and recorded it almost entirely on his own in his Greenwich Village apartment. The record’s sound is an undeniable departure from that of the band’s early material, migrating from guitar-driven indie rock to experimental electro-pop. The mesmerizing opener “Underwater” immediately sets the tone for a collection of songs that masterfully paint pulsing, hypnotic atmospheres. The twinkly synths and thumping bass lines of tracks like “Mood” and “Glow” create inescapably danceable grooves; make no mistake, this record’s got some bangers. While Pool undoubtedly has a different feel sonically, the elements that set Porches apart remain. Aaron’s moody, crooning voice is still potent as ever, and the songs retainthe same intense and dreamy ambience of Slow Dance. Lush, trance-like soundscapes recall Angelo Badalamenti’s work on the Twin Peaks soundtrack; it might not be too far-reaching to say that Pool is like if David Lynch wrote a modern-day indie rock record. Occasionally, the songs deviate from spooky to unsettling; I want to like “Hour” for its ’80s feel and floaty verses, but the song’s grating, non-melodic intro synth line sounds less like a track pulled from the Drive soundtrack and more like the opening theme to American Horror Story. I have a feeling many Slow Dance fans aren’t going to like Pool, not merely due to the shift in genre, but because it simply doesn’t have the immediacy of old songs like “Headsgiving” or “Skinny Trees.” This isn’t to say that Pool is emotionally shallow; rather, it takes time for the material to sink in. The electronic overtones and AutoTune at play tend to obscure the record’s revealing lyrical content, with lines like “I just wait around to hear the good news / To hear from you” musing on conditions of longing and solitude. Hopefully longtime Porches followers will not underestimate the substance that Pool has to offer.